Boil one litre of water in pan, add spinach leaves and boil it for a minute, turn off the flame. Drain the water, take out the boiled spinach in a blending jar and keep it aside. Heat oil in a pan, add cumin seeds, fry it for few seconds then add green chilli, ginger, garlic. Add onions and fry it on medium flame till it turns light brown(2-3 minutes) . Add chopped tomato, cook on medium flame till it turns little soft (2-3 minutes). Turn off the flame and let it cool down, take out the fried ingredients in the same blending jar. Add little water and blend it into thick smooth paste, keep it aside. Heat oil in same pan, add turmeric powder, red chilli powder, coriander powder and cumin powder. Fry it for 20-30 seconds, add the prepared paste, keep stirring. 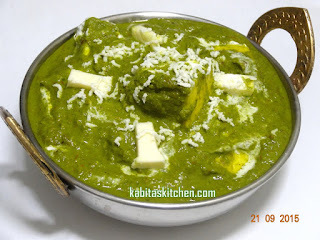 Add fresh cream and paneer cubes, mix it well in gravy. Add garam masala powder and salt to taste, mix it well. Cover the pan and cook it for 2 minutes on low flame, turn off the flame. Chop the Fenugreek leaves (methi) and wash it. Heat oil in a pan, add cumin seeds and fry it for few seconds on medium flame. Add chopped onion and fry till it turns light brown on medium flame. Add chopped potato, turmeric powder, salt to taste and mix it properly. Cover the pan and cook it for 4-5 minutes on low flame. 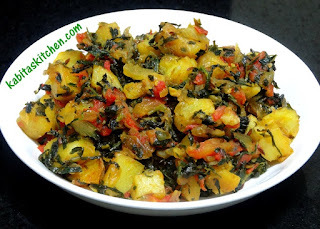 Add chopped methi leaves, mix it and cook it for 2-3 minutes on low flame (cover the pan). Add chopped tomato, mix it and cook it for 8-10 minutes on low flame (cover the pan and keep stirring in between). Chop the capsicum in square shape and discard the seeds. Roast the gram flour in a pan for 2-3 minutes on low-medium flame. Take out the roasted gram flour in a bowl and clean the pan with kitchen towel or water. Heat the same pan, add oil and allow the oil to heat properly. Add fennel seeds and cumin seeds, fry it for few seconds on medium flame. Add chopped green capsicum and fry it for a minute on medium flame. Add turmeric powder, red chilli powder, cumin powder, coriander powder, dry mango powder and salt to taste. Mix all the spices properly and cook it for 2 minutes on medium flame (do not cover the pan). Reduce the flame to low, add the roasted gram flour in the fried capsicum and mix it properly. Increase the flame to medium and cook it for 2 minutes, keep stirring in between. Increase the flame to high and fry it for a minute, keep tossing/ stirring. Heat oil in a pressure cooker pan, allow the oil to heat properly. Add cumin seeds, dry red chilli and bay leaves, fry it for few seconds on medium flame. Add chopped onions, fry it on medium flame till it turns soft . Add ginger garlic paste, fry it for a minute with onions on medium flame. Add chopped tomato, cook it on medium flame till tomatoes turns soft . Add turmeric powder, red chilli powder, coriander powder and cumin powder. Mix it and cook it for 2 minutes on low flame. 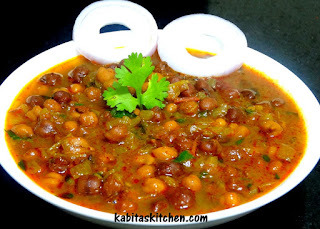 Add soaked kala chana and mix it with cooked masala. Increase the flame to medium and fry it for 2 minutes, keep stirring. Add 1.5 glass of water, garam masala powder and salt. Close the cooker lid with whistle, cook it for 5 whistles on medium flame. After five whistles, turn off the flame and allow the cooker to cool down. Open the lid carefully, sprinkle chopped coriander leaves and stir it. Garnish with onion slices, ready to serve. Turn on the flame and heat a pressure cooker pan. Add chopped tomato, Chopped onion, garlic, ginger, almonds and cashews. Fry it for 2 minutes on low-medium flame, keep stirring. Add one glass of water, stir it and close the lid of pressure cooker. Boil it for two whistle on high flame and turn off the flame. Open pressure cooker when it has cooled down. Take out the boiled ingredient in a blending jar, keep the stock(boiled water) separate for further use. Grind it into smooth paste(do not add water or stock), keep it aside. Add whole spices and fry it for few seconds on medium flame. Add turmeric powder and red chilli powder in the oil, mix it. Add blended masala paste, coriander powder and cumin powder, stir it. Cover the pan and cook it for 2 minutes on low-medium flame, keep stirring in between. Reduce the flame to low, whisk the curd and add it in the fried masala paste, keep stirring, cook it for a minute. Add stock/water(1/2 glass), salt to taste and stir it, cover the pan and cook it for a minute on low flame. Add paneer and gently mix it, add fresh cream and stir. Add garam masala powder, mix it and cover the pan, cook it for another minute on low flame. Turn off the flame, ready to serve. 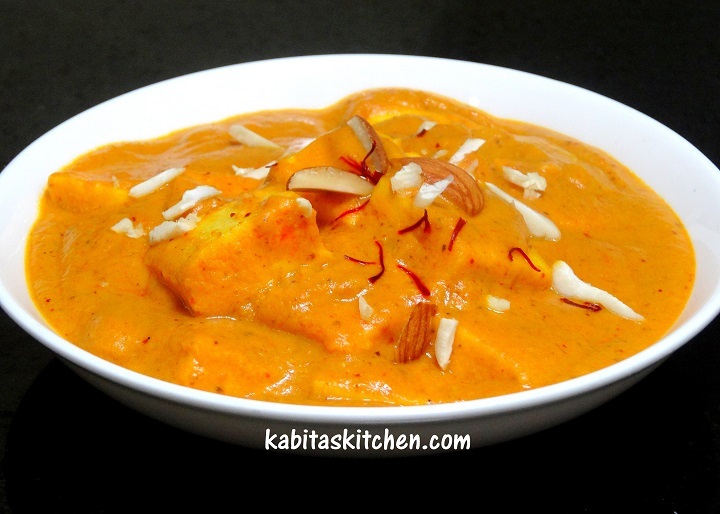 Serving tip :Garnish with some chopped almond, cashew, saffron and cream. Heat oil in a pan, add bay leaves, cumin seeds and green chilli fry it for few seconds. Add grated ginger and garlic Fry it for 1/2 minute on medium flame. Add chopped onion Fry the onions till it turns golden brown on medium flame. Mix the spices and fry it for a minute on low flame. Add chopped tomato and fry till tomatoes turns soft, cover the pan. 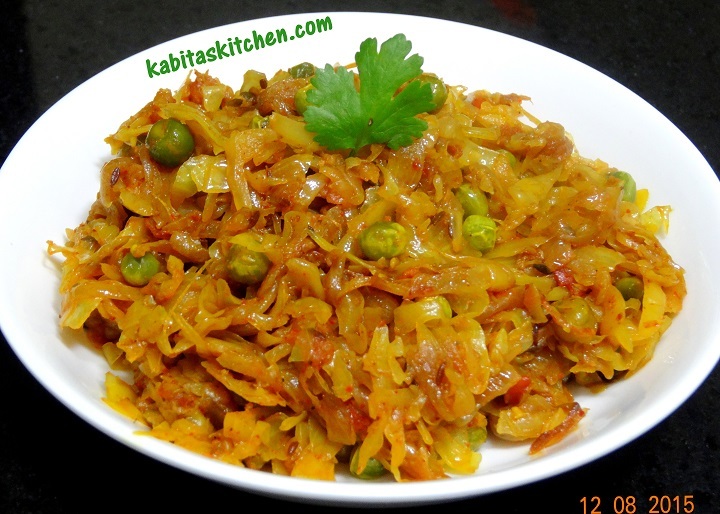 Add chopped cabbage, green peas and salt to taste, mix it. Cover the pan and cook it for 14-15 minutes on low-medium flame (Keep stirring in between). Add garam masala powder, Mix it. Cover the pan and cook in on low-medium flame for a minute. Turn off the flame, garnish with coriander leaves and ready to serve. 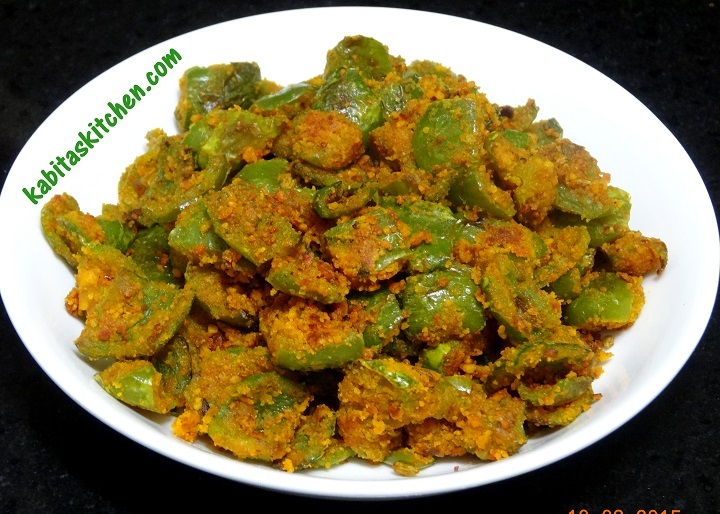 NOTE-If you are using fresh peas, fry it with onions and spices for 3-4 minutes.